Just like the LG AKA itself, the bundle is rather unusual. The mandatory accessories are of course supplied, a 1.2A A/C adapter and a microUSB cable, along with a cheapish looking headset. But half of the box is occupied by your AKA mascot, YoYo in our case. It's rather solid and heavy, with a pleasant rubbery feel to it. The mascots can be used in a dedicated selfie cam shooting mode, but more on that later. Finally, the box cover is a nice folding page, which introduces you to the four different AKA creatures. LG AKA stands at 138.7 x 71.9 x 10mm and weighs 135g, which is about average for a 5" smartphone. Its mask adds an extra 1 to 3mm of thickness without putting on much weight. It also keeps the screen protected from scratches, so you won't need to get a case for that purpose. The LG AKA has the spirit and feel of the G series, scaled to its budget of course. The handset has clean and simple design with the trademark rear-placed power and volume keys. There is even the laser-assisted autofocus for the camera too. If it wasn't for the proprietary front covers, the AKA would have looked like the LG G2 mini with its matte textured battery cover. The AKA's mask is made of glossy plastic, which is quite prone to fingerprints. LG did a great job shaping it though and it feels natural on top of the AKA. It snaps on firmly, and smoothly slides up and down to reveal whatever those smiling/asking/mysterious/drowsy eyes are looking at. 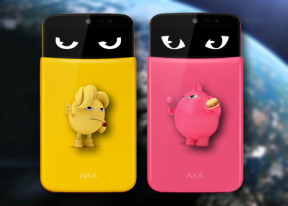 LG is selling all the proprietary cases separately (rear cover + mask), so when you've had enough of your Aka's original personality, you can easily change it just by snapping a new case on. There's a point system associated with buying new accessories for your Aka, which is an interesting (if a bit questionable) monetization strategy from LG. The LG AKA is a nice phone with simple and efficient design. The mask is easy to use, and the comfortable rear control deck certainly helps the handling at this screen size. We've always been keen on the idea of the rear keys and this time the screen mask has made them even more relevant. The overall handling of the AKA, despite the glossy mask, is very good. The phone is of solid build, the rear cover provides excellent grip thanks to the matte finish and texture. If you don't mind cleaning fingerprints off the mask every now and then, there is a good chance you'll like the AKA too. Above the 5.0" IPS display, there is the earpiece and the 2.1MP secondary camera, capable of 1080p video recording. A hidden status LED and a couple of sensors are also around. There are no hardware controls below the AKA's screen. The left and right sides of the LG AKA are completely bereft of controls as well. There is a lanyard eyelet in the top right corner - which will most likely be used for attaching charms. The top of the LG G2 features the secondary mic and the 3.5mm audio jack. The bottom has the microUSB port between two grilles: one for the primary mic and another one for the speaker. AKA's back is where things are quite familiar for the signature LG combo of volume controls each side of a Power/Lock key. The 8MP camera lens is placed left of the buttons, the LED flash and the focus assist are on the right. When the screen is locked a long press on the Volume Up key launches the Quick Memo tool, while a long press on the Volume Down control fires up the camera. You can use that key as a shutter button too. Popping the battery cover open grants access to the removable 2610 mAh battery. Unfortunately, the microSD card and SIM slots aren't hot-swappable as the battery gets in the way. The battery, microSD and SIM card slots.